Web tension has an important role in the sectors of converting, paper and carton board, aluminium foil, textile, wire and cables. Tension control and regulation are necessary to keep constant the desired web tension, avoiding the possibility of material breaks in any phase of web processing. 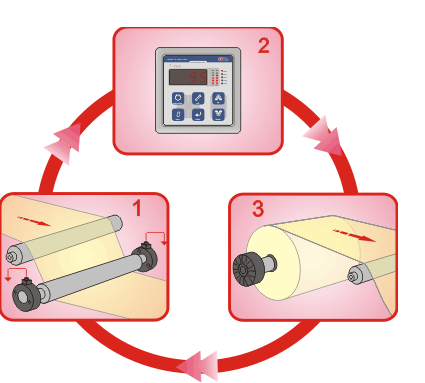 For 30 years Re spa have developed and produced tension controllers for laminating and more. 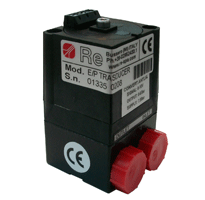 There are thousands of applications in which Re spa tension controllers have been installed, from the beginning with the analogical control 70.01 and latterly with the series MW.90. There are more than 5000 systems installed worldwide, and more than 100 customized software packages, till the best seller T-one and the last one T-two. Versatility, reliability and performance are the main features that have allowed the success to Re Spa’s tension controllers over the years worldwide. 2. The tension controller compares the web tension value with the predetermined reference “setpoint” and gives the input to the brake or motor to adjust the web tension. 3. The brake, changing the torque, or the motor, changing rpm, modify the web tension according to the desired value. 1. 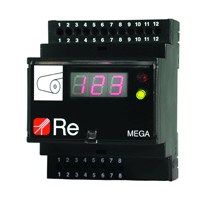 The ultrasonic sensor US.3 detects the reels diameter and compares it with the predetermined reference “setpoint”. 2. The brake or the motor acts to modify the web tension according to the desired value.